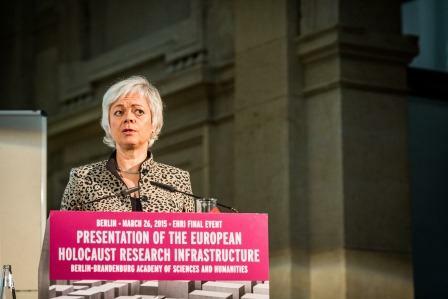 On 26 March, after 4 years of work, the project European Holocaust Research Infrastructure (EHRI) presented its results. 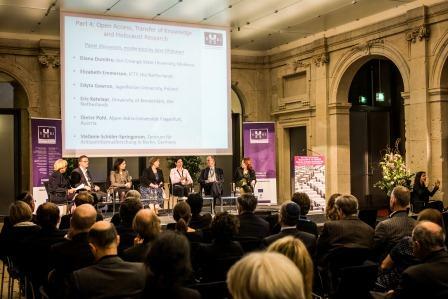 This presentation took place at the beautiful and befitting Berlin-Brandenburg Academy of Sciences and Humanities in Berlin. 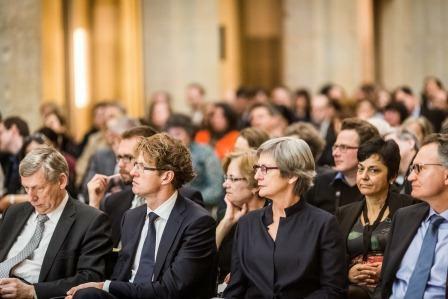 To honour the occasion, an interesting programme was put together that featured contributions from politicians, historians, researchers, archivists, and digital infrastructure experts. The 200 guests that were in attendance mirrored the wide scope of the programme. 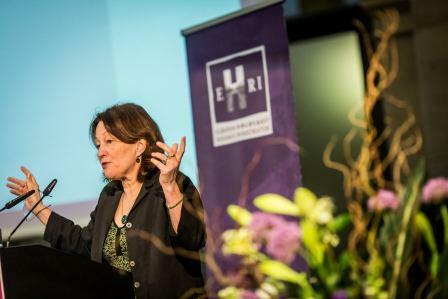 See 52 EHRI Presentation photos. The day started with a press conference where EHRI Project Director Conny Kristel together with three politicians - Sander Dekker, Dutch State Secretary for Education, Culture and Science, Cornelia Quennet-Thielen, German State Secretary at the Federal Ministry of Education and Research, and Prof. Marek Ratajczak, Polish Secretary of State at the Ministry of Science and Higher Education, and Robert-Jan Smits, Director-General of DG Research and Innovation of the European Commission - stated the importance of EHRI for European society. 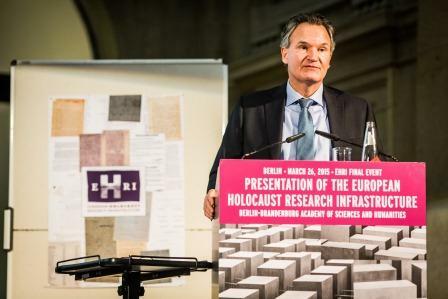 To everyone’s delight, Robert-Jan Smits announced that EHRI will continue to expand under Horizon 2020, the biggest EU Research and Innovation programme ever. 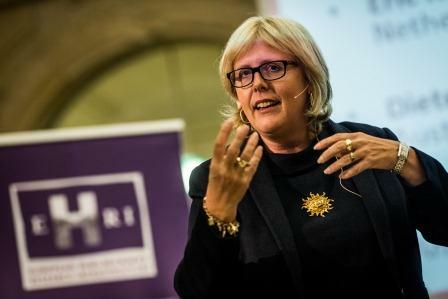 Conny Kristel also introduced the moderator of the day, Jane Ohlmeyer who is Professor of Modern History at Trinity College Dublin, Ireland. After Aliki Arouh, the Director-General of DG Research and Innovation of the European Commission, Robert-Jan Smits, took the floor. 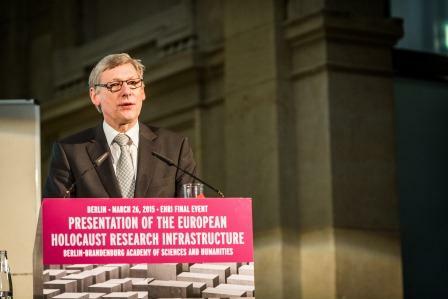 He announced to the assembled audience the continuation of EHRI, and formally opened the EHRI portal by starting a short film about the European Holocaust Research Infrastructure. Next were three European politicians that honoured the event with their presence, the Dutch State State Secretary for Education, Culture and Science, Sander Dekker, Cornelia Quennet-Thielen, State Secretary at the Federal Ministry of Education and Research, Germany, and Prof. Marek Ratajczak, Secretary of State at the Ministry of Science and Higher Education, Poland. 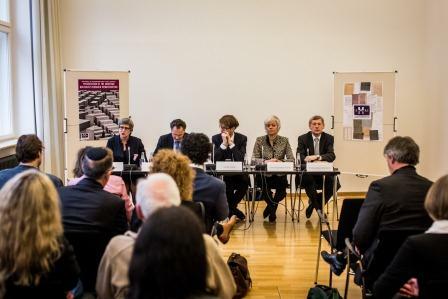 They all spoke of the importance of an initiative like EHRI and the urgency to keep on remembering the Holocaust. 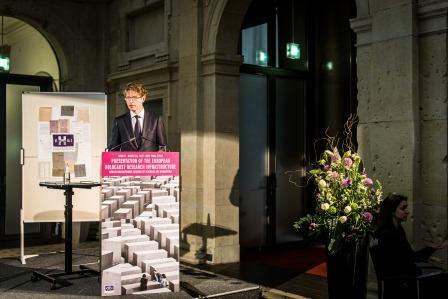 The speech of Sander Dekker received an Honorable Mention from the 2016 Cicero Speechwriting Awards. Read speech. 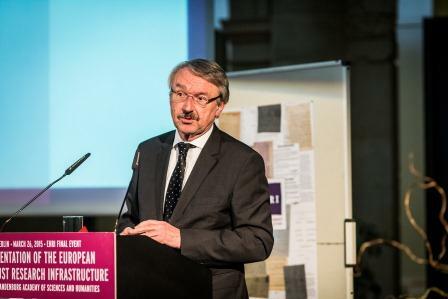 This formal part of the programme was closed by Prof. Günter Stock, President of ALLEA (All European Academies), and of the Berlin-Brandenburg Academy of Sciences and Humanities, the venue that hosted the EHRI Presentation. He started his speech with the remark that science and research in Europe really need to cross borders. 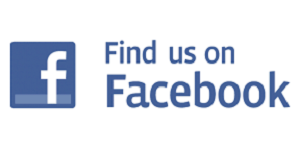 In that sense he praised EHRI as ‘(…) an example of truly open science’. Moderator Jane Ohlemeyer led the short discussion after the keynote speech. During the lunchtime break, more than just food was on offer. 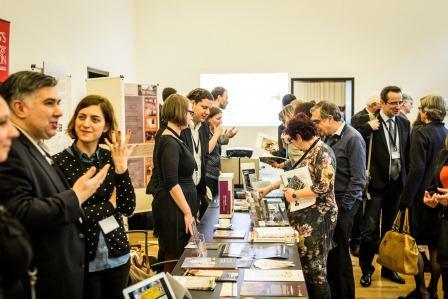 In separate rooms, guests could watch three short films that EHRI has produced, visit a market place where EHRI partner instiutions presented themselves, explore the EHRI portal and the EHRI Online Course in Holocaust Studies, and talk to EHRI staff, fellows and summer school participants. 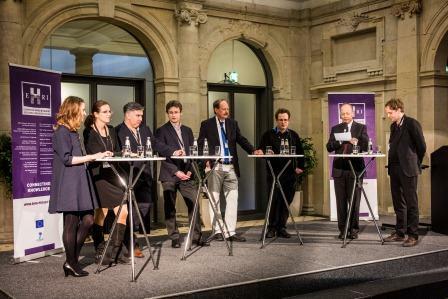 After lunch the atmosphere was less formal when two panels took to the stage. 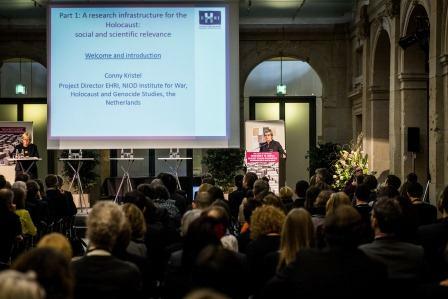 First, EHRI team members talked about their achievements, the successes and difficulties of making the European Holocaust Research Infrastructure. In the second panel, Diana Dumitru from the Ion Creangǎ State University, Moldova, Elizabeth Emmerson, Chief Archivist at the International Criminal Tribunal for the former Yugoslavia (ICTY), Edyta Gawron, Assistant Professor at Jagiellonian University, Poland, Prof. Eric Ketelaar, Professor Emeritus of Archivistics at the University of Amsterdam, Prof. Dieter Pohl from the Alpen-Adria-Universität Klagenfurt, Austria and Prof. Stefanie Schüler-Springorum, Director of the Zentrum für Antisemitismusforschung in Berlin, Germany discussed the topic of open access and transfer of knowledge regarding Holocaust research. Although the members generally agreed on the importance of open access, several obstacles and hesitations were also put forward. The successful day ended with a reception. 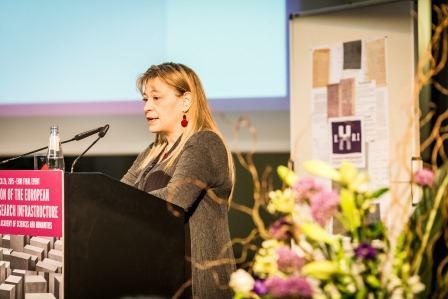 See more EHRI Presentation photos.